For well over three years, Donald Trump has been under attack. He has been subjected to unprecedented slander by the media, dirty tricks by the Democrats, legally dubious investigations, and sabotage by the deep state. Yet he is not only still standing, he has a record of accomplishments that any president would be happy to claim after two years in office. One would think his opponents would be able to divine a message from this. To wit, their time might be better spent working on behalf of the voters rather than launching further futile attempts to bring Trump down. Moreover, the polls have increasingly indicated that this would not only be the right thing to do, it would be the smart move. A new Morning Consult poll — hardly predisposed to favor President Trump — shows enthusiasm for impeachment among registered voters continuing to plummet. Only 34 percent of registered voters favor ousting Trump, and among Independents that percentage is only 31 percent. Even among Democrats, the percentage who want to see the President impeached has fallen by 12 points (from 71 to 59 percent). The voters, in other words, are done. Yet Trump’s antagonists are clearly determined to lengthen their losing streak. It began when he announced his intention to run for president in June of 2015. Typical of the media reception he received was the NBC story titled, “Donald Trump Announces Presidential Bid by Trashing Mexico, Mexicans.” What he actually did, of course, was say what every major politician regardless of party had already said about illegal immigration at our southern border. Soon, however, virtually every “news” outlet began claiming that he had called all Mexicans rapists and killers. At length, all this skullduggery morphed into the Mueller probe — a $34 million “investigation” that confirmed that the Russia Hoax was… well… a hoax. But the Democrats haven’t yet grown weary of losing. They are angry about Trump’s tax reforms and aggressive deregulation, which have produced a booming economy as well as record low unemployment. They are frustrated with his energy-friendly policies and his release of most Americans from the Obamacare gulag. They seethe because he is reshaping the judiciary by appointing real judges rather than political hacks. Due to the serious constitutional questions raised by this request and the serious consequences that a resolution of those questions could have for taxpayer privacy, the Department is consulting with the Department of Justice. Although federal law establishes no deadline for a response to your request, we expect to provide the Committee with a final decision by May 6. This fiasco will surely end up being a net plus for Trump.… News audiences were betrayed, and sooner or later, even the most virulently Trump-despising demographics will realize it and tune us out. The only way to reverse the damage is to own how big of a screw-up this was, but after the last three years, who would hold their breath waiting for that? Are these people really so obsessed with bringing down the President that they can’t see they are making his case about “the swamp” with slander, partisan investigations, and deep state sabotage? I stumbled across a Latin tag the other day that Trump’s antagonists should learn: Saepe intereunt aliis meditantes necem. This translates into English as, “Those who plot the destruction of others often destroy themselves.” They have been trying to destroy Trump for three years, and he’s still standing. If they keep it up, he will win reelection in 2020. Will they never tire of losing? Monday’s release of the annual report from the trustees of Social Security and Medicare reminds us, this time all the more urgently, that Congress and the president are derelict in their duty. Without concerted action of the sort Ronald Reagan, Bob Dole, and Daniel Patrick Moynihan used to substantially increase the life of Social Security in a grand compromise in 1983, both federal retirement programs face doom. Trustees say that for the first time since 1982, the main Social Security trust fund is expected next year to pay out more money than it takes in. By 2035, Social Security’s official trust fund will be entirely depleted, they say. The trust fund for Medicare Part A will be depleted far sooner than that, in 2026. Yes, sustained economic growth can push back the respective days of reckoning by a year or two. On the other hand, with unemployment at a 50-year low, history says the odds of a slowdown or recession are higher than those of continued growth — which means the depletion dates, if anything, are more likely to be, not later, than 2035 and 2026. The situation screams out for significant legislation. Fortunately, I have a proposal. In some ways its effect is mostly to shift the book-keeping for various streams of federal tax money, to the detriment of the non-retirement-systems debt and the benefit of the retirement systems. Nonetheless, I believe it will help the economy at the margins, provide for higher wages for non-executives, and provide more public clarity and confidence. Space doesn’t allow a full explanation of each part of the Hillyer Plan. That will come in later columns. Herewith, though, is a list of the elements thereof. The first is a very rough tradeoff of “general fund” revenue for money specifically dedicated to Social Security and Medicare — with the added goal of making accounting less complicated by dealing in whole or round numbers. The current payroll tax dedicated to Social Security is 6.2 % each for the employee and the employer, and the Medicare tax is 1.45% each for the employee and employer. I would bump the former up to 6.5% each, and the latter up to 1.5% each. End those weird fractions, and put the tiny increases into the two trust funds. To help corporations pay for the added cost, let’s cut the top corporate income tax rate from 21 % to an even 20%.At the same time, the 20% deduction for pass-through businesses, which under current law will end after 2025, should be made permanent. Two more major changes will lengthen the actuarial life of both programs. First, lawmakers should bite the bullet and do exactly what Dole and company did in 1983, and allow the age for qualification for full benefits once again to rise. The Social Security full-eligibility age is now rising to 67 by 2027. Let it keep rising, over the subsequent six years, to 68. Likewise, the Medicare full-eligibility age, now 65, should start rising slowly to 66. Now come the two bolder proposals. First, it’s long past time for adoption of some version of what presidential candidate Pete DuPont proposed as early as 1987, and as the Institute for Policy Innovation think tank again proposed on Monday: Allow younger workers to use some of their payroll tax money to go into separate, private accounts (with their future claims on ordinary Social Security being reduced accordingly). A smart business would see that paying 49 workers an extra $1,000 each would be more cost-effective than bumping up the top guy by another $50,000. If companies still want to keep paying executives much more, well, they would need to factor in added payments to the federal retirement systems, to the benefit of the systems’ long-term solvency. So, there you have it. I’m no actuary, but I think my proposals combined would extend the life of the retirement programs by well more than a decade each, while making accounting easier and boosting ordinary wages. But, because the top corporate rate would drop and the pass-through deduction would be made permanent, the overall tax burden on the economy would rise barely, if at all. Plus, younger workers would enjoy a more growth-oriented option. Win, win, win. There is a quite obvious conclusion to be drawn from the release Thursday of the Mueller report — namely, that the entire investigation undertaken by special counsel Robert Mueller over the allegation that President Trump’s campaign was in cahoots with the Russians and therefore engaged in treason was a made-up ruse for the purpose of weaponizing the government against the candidate of an opposition party. Mueller found no evidence not just of collusion between Russia and the Trump campaign, but between Russia and any American citizens. The report did uncover evidence of meddling by Russia in the 2016 election, which was anything but surprising — there has been Russian meddling in American elections since the Russian Revolution of 1917. But after almost two years and millions of dollars spent, the lack of any substance behind the Trump-Russia meme the Democrat Party has staked its political future on should shock every American to the core. We now know that the Obama administration engaged in an abuse of power which makes Watergate look like a third-rate burglary. It colluded with Hillary Clinton’s campaign to use paid-for opposition research the latter knew or at least highly suspected was a pack of lies to fraudulently obtain FISA warrants to spy on guiltless American citizens, and it participated in a counterintelligence frameup to provide a pretext for prosecuting an unwitting Trump adviser named George Papadopoulos, who was fed a rumor that Russia hacked Clinton’s emails and ultimately spent 14 days in jail after being caught in a perjury trap over his having regurgitated the rumor to another party. It’s not an overreaction to see this horrific and dastardly abuse of power as the most dangerous scandal in American history. Watergate, Teapot Dome, Iran-Contra — none of them cut so deeply into the framework of our constitutional traditions with so much corruption at the highest levels. It is this recognition which should dominate the reaction to the Mueller report. Not just that it found no evidence of collusion but the abusive attempt at a frame-up lying under the entire investigation, which is now laid bare for anyone willing to see it. It is good news that there was insufficient evidence to charge the President of the United States with having conspired with a foreign adversary or with having obstructed justice. The alternative would have taken us through a wrenching process with the potential for constitutional crisis. The business of government can move on. Even so, I am sickened at the extent and pervasiveness of dishonesty and misdirection by individuals in the highest office of the land, including the President. I am also appalled that, among other things, fellow citizens working in a campaign for president welcomed help from Russian — including information that had been illegally obtained; that none of them acted to inform American law enforcement; and that the campaign chairman was actively promoting Russian interests in Ukraine. Hogwash and balderdash, with decency preventing a more descriptive term to describe Romney’s perfidious scoldings of a Republican president. Yes, the Mueller report contains lots of embarrassing stories about Trump’s reactions to the Russian collusion frame-up as it was presented to him, and yes, those stories indicate a president driven half-mad over the lengths his political adversaries would go in an effort to destroy his presidency. For Romney to focus on those breaks from decorum — actions which did not follow from Trump’s intemperate words thanks to the success of his staffers in keeping him in check — rather than the true nature of the Trump-Russia hoax shows that he’s learned nothing in political life. He’s intentionally missing the forest for the trees, and this after he was beaten by a political movement and an administration which shamelessly slandered him as a racist and sexist despiser of the poor. You would think Romney would have commiserated with Trump over the treatment both shared at the hands of the Obama cabal. And Romney’s friend William Weld, who like Romney was a mediocre Republican Massachusetts governor with a poor record as a candidate for federal office — Weld was the vice-presidential candidate of the Libertarian Party in 2016, a ticket faring a whole lot worse than Romney’s GOP slate in 2012 — followed up Mitt’s ankle-biting of Trump with his own attack on the president’s poor form. 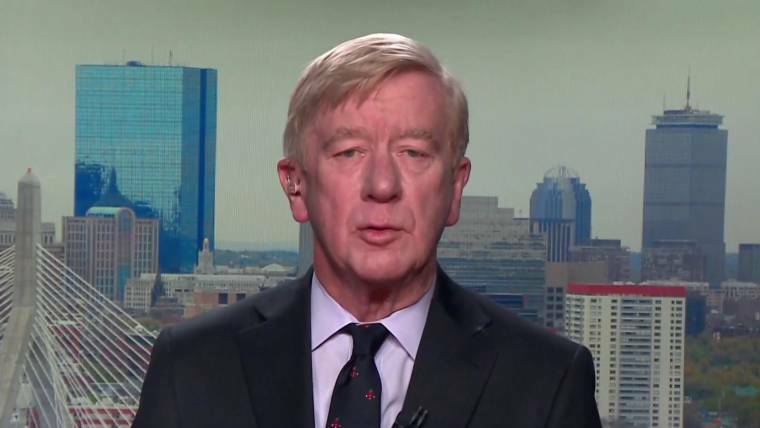 Weld took to MSNBC and in true pet-conservative fashion called Trump a “one-man crime wave,” something more in keeping with his status as a wannabe primary challenger with no more chance to become president than he had as Gary Johnson’s sidekick three years ago. Republicans are the party of people who want politics to play a smaller role in our lives. But that doesn’t excuse having such pantywaists and losers carrying its standard. If Romney and Weld can’t defend a Republican president, even one as crude as Trump with his Irish up, under such vicious and abusive attack from the Obama administration and the Deep State, then they deserve not a shred of loyalty or deference from conservative Americans. Sickened? Romney’s sanctimony is sickening. That’s why he isn’t president and never will be. That’s an office not for the weak. It’s too bad Senate seats in Utah aren’t similarly restricted. One didn’t have to be a golf fan to know something of Tiger Woods’s troubles when they became the subject of tabloids more than a decade ago. A man who appeared to have everything, his whole world seemed to come apart before a public ravenous for gossip and always ready to trample its heroes. His wife, Elin Nordegren, left him and the divorce was ugly. A number of his friends and key sponsors deserted him. Even a couple of his mistresses, complicit in his private sin, nonetheless capitalized on his notoriety and delivered him over to the bottom feeders at TMZ, People, and US Weekly with no thought whatsoever of him or his wife and children. And, in a cruel twist of fate, health issues started to plague his play. Thus, began Tiger Woods’s terrible and humiliating descent into an abyss. He became a late-night punchline, a has-been. Talk show hosts speculated with regularity that he would never win a major golf tournament again. His greatness was gone, the pundits declared with finality and not just a little relish. I am not a golf fan. Until last weekend, I had never watched golf on television. But I have been quietly rooting for Tiger Woods for years. From the moment news of his troubled life made headlines in 2009, I went from being indifferent to feeling compassion for him. Whenever I heard his name on radio or television, I said a quick prayer for him. Not necessarily for tournament wins, but redemption; Redemption with a capital “R.” I have felt an odd connection with him. Our lives, our goals, our sins are not the same, but I have known what it is to attain something and lose it. I have known what it is to hurt those you love and to be hurt by others you love. I have known what it is to struggle with painful memories that refuse to stay buried. I have known the falsity of friendships that weren’t what you thought they were. And I have known what it is to be delivered over to a vicious media all too willing to gleefully aid in your destruction if it gets clicks. Many of us hoped and prayed for Tiger… Tiger was, in the end, a human being. Just like the rest of us. He too had flaws, pain and wounds…. Looking at some of the sports posts on Facebook and Twitter, there are still a lot of Tiger detractors out there. Some just can’t forgive him. Some can’t let go of their hate…. Your win — and the outpouring of love and joy from across this great country — showed the world what forgiveness looks like. And what grace looks like, too. A lot of ink has been spilled on Tiger Woods as a redemption story this week. Much of it has been trite. Worse, many of those jumping on Woods’s bandwagon now are the very media outlets that capitalized on — and reveled in — his past failures. And they will do it again should he again fail. Habeeb’s column, however, has substance. As an evangelical Christian, Habeeb was praying and cheering for the right things. I will quibble with his characterization of forgiveness and redemption a bit when I say that Tiger didn’t sin against the public and therefore doesn’t need their forgiveness and Redemption is entirely a work of God that has nothing whatsoever to do with Masters Tournament championships. Perhaps it is more accurate to say that Tiger Woods’s victory last Sunday is a great comeback story rather than a redemption story. But what a dramatic comeback story it is! What’s next? Will he and Elin reconcile? Now that would be an even better story. I don’t know Tiger Woods and I don’t dare judge him. The man has endured enough of that for several Buddhist reincarnations (or “rebirths” as I think they call it). Rather, I pray that in the light of his recent triumph he gives credit to a God whose grace is so remarkable that he bestows a measure of it even on those who don’t know him. I pray for Tiger Woods’s redemption — his real redemption. An interesting economic side note: Nike is one of the few sponsors that stayed with Woods when his life — and his endorsement value — went into a tailspin. The message Nike wanted to send, says sports marketing consulting Joe Favorito, is that “the company will stick by you when the chips are down.” It literally paid off. Nike’s stock, which has been in freefall for much of this year, surged by more than $4 billion in the wake of Woods’s Masters victory. When “questions arose” about Russia’s support for Trump, and WikiLeaks released damning DNC emails, “Trump publicly expressed skepticism that Russia was responsible.” Trump denied having Russian business partners, “even though as late as June 2016 the Trump Organization had been pursuing a licensing deal for a skyscraper to be built in Russia.” But would Trump engage in obstruction if he wasn’t guilty of collusion? Trump asked then-FBI Director Comey to show a little mercy to Michael Flynn after the latter got snagged in a perjury trap: “I hope you can see your way clear to letting this go… He is a good guy.” Trump asked his Deputy National Security Advisor to draft a letter stating that he “had not directed Flynn to discuss sanctions with Ambassador Kislyak.” Again, would Trump engage in obstruction if he wasn’t guilty of collusion? This is nothing more than Trump’s anger pursuant to the desire of then-Attorney General Sessions to recuse himself from the investigations, and that he “reached out to the Director of National Intelligence and the leaders of the Central Intelligence Agency (CIA) and the National Security Agency (NSA) to ask them what they could do to publicly dispel the suggestion that the President had any connection to the Russian election-interference effort.” What would be the point in obstruction if Trump wasn’t guilty of collusion? This goes back to the claim that firing Comey somehow amounted to obstruction of justice. “The day of the firing, the White House maintained that Comey’s termination resulted from independent recommendations from the Attorney General and Deputy Attorney General that Comey should be discharged for mishandling the Hillary Clinton email investigation.” Why would he engage in obstruction if innocent of collusion? Obviously, Trump didn’t regard this news as the high point of his day. “On June 14, 2017, the media reported that the Special Counsel’s Office was investigating whether the President had obstructed justice. The President reacted to this news with a series of tweets criticizing the Department of Justice and the Special Counsel’s investigation.” Can Trump’s tweets be considered obstruction if he wasn’t guilty of collusion? Now we’re back to AG Jeff Sessions. “The President met one-on-one in the Oval Office with his former campaign manager Corey Lewandowski… and dictated a message for Lewandowski to deliver to Sessions.” The message was that the Special Counsel investigation was unfair to Trump and should be focused on election meddling in future elections. Why would Trump engage in obstruction if he wasn’t guilty of collusion? This involves the tall tale of Donald Trump, Jr. meeting with a Russian lawyer who was allegedly offering damaging information about Hillary Clinton. The President “directed aides not to publicly disclose the emails setting up the June 9 meeting, suggesting that the emails would not leak and that the lawyers with access to them should be limited.” Again, would Trump engage in obstruction if he wasn’t guilty of collusion? Trump once again pleaded with Sessions to unrecuse himself: “The President said, ‘I’m not going to do anything or direct you to do anything. I just want to be treated fairly.’ Sessions volunteered that he had never seen anything ‘improper’ on the campaignand told the President there was a ‘whole new leadership team’ in place.” Sessions remained firm on recusal. Why would Trump engage in obstruction if he wasn’t guilty of collusion? In response to an early 2018 press report that the President had directed McGahn to have the Special Counsel removed and that McGahn had threatened to resign rather than carry out the order… “The President then met with McGahn in the Oval Office and again pressured him to deny the reports.” McGahn presumably demurred. Once again, would Trump engage in obstruction if he wasn’t guilty of collusion? Flynn eventually withdrew from a joint defense agreement with Trump and began cooperating with the government. Trump’s personal counsel “left a message for Flynn’s attorneys reminding them of the President’s warm feelings towards Flynn.” Meanwhile, “the President praised Manafort in public and declined to rule out a pardon.” Yet again, why would Trump engage in obstruction if he wasn’t guilty of collusion? America’s conservatives should be those least amazed by our left’s calls for wealth confiscation. The only surprise here is the flaunting. After all, wealth confiscation is what the left everywhere has always done. Once in power, it is the only way the left’s policies can survive. As 2020 nears and the pursuit of increasingly restive radicals increases, the politicians courting them aggressively seek more extreme positions. The fear of the “liberal” label is long gone and the “socialist” sobriquet is all the rage among those who rage. With the Marxist moniker come the policies. Higher taxes on the wealthy and corporations are already passé. It is no longer enough to tax the wealthy more via their income. Now the target is their wealth directly. Calls for such blatantly confiscatory policies are still shocking to most Americans. However, as we have been repeatedly taught by the left globally, such sensibilities are hopelessly out of step with the new “progressivism.” In one sense America’s left is right in its calls: The only shocking part is their explicit nature. Usually America’s left does not admit it aims, pursuing them instead silently. The left pursues confiscatory policies not just because it supports them in its own right — though assuredly it does — but because it inevitably must. The left always starts with enemies. The question is how broadly it defines them and how stringently it pursues them. The answer depends on the amount of power the left has. Depending on place and parlance, the left’s enemies range from “the rich” and corporations, to capitalists, the bourgeoisie, and “enemies of the state.” Confiscatory policies are aimed at them because, in the words of the bank robber Willie Sutton, “that’s where the money is.” Initially these strike a blow, but they also stake the left’s expensive spending policies. But the more the left’s policies are implemented, the more they fall short. If implemented broadly enough, the economy itself falls short. Regardless, increased resources are needed to make up the shortfall. The phenomenon is akin to the Laffer Curve, albeit beyond tax revenue alone. The economist Arthur Laffer described how increasing rates of taxation, once they hit the inflection point, actually result in declining tax revenue. This creates the potential for reversal: Cutting tax rates above their inflection point results in increased revenues. This observation can be applied to the left’s policies in toto. Entitlement programs continue to escalate — either through increasing benefits, increasing utilization, or both — until they become unaffordable, requiring additional resources or rationing. Subsidies become utilized until too costly and the product subsidized goes into short supply or is rationed. Regulations mount to an extent that the activity regulated becomes less available or less desirable. Given sufficient power, the left can inflict this across an entire economy. There is no shortage of examples of this happening in individual programs here, and no shortage of this happening economy-wide abroad. It is an economic tenet that resources are limited. It is a political tenet that the left’s reach is unlimited. The only way to square this circle is to take more through confiscation. Of course, even compulsion can swim only so long against the economic tide — as the drownings of so many socialist and communist countries prove. The left has never been able to solve the question why those being increasingly confiscated from would indefinitely consent to producing more. The overall effect is analogous to a farmer eating his seed corn. Faced with a disappointing harvest, instead of curtailing consumption the farmer decides to dip into the stock he should set aside for next year’s planting. When spring comes, he sows less, and when harvest time comes, his yield is even shorter. Repeating the cycle, each year falls shorter and shorter. Eventually, he has only enough to eat, but none to plant. So it is with the left. It must make up its shortfall from others — confiscating what it lacks — until all fall short. If this sounds preposterous, look back to the left’s own past — the Soviet famine of 1932-33 and Communist China’s Great Leap Forward — or simply look at its present in Venezuela and North Korea. Or take its programs in isolation and see their inability to meet demand or be self-sufficient. Without external subsidization, they fail. This is only new to America. Here, the left’s programs are subsidized from the general budget and the budget shortfall is borrowed. Hidden from view, there has been a quiet truce: The left pursues its course in incremental steps, accepts its subsidies, and in return does not explicitly call for confiscation. However, America’s New Left reject this historical accommodation and its incrementalism. Emboldened it seeks bigger prizes — a Green New Deal, Medicare for All — and its needs (and wants) bigger prey. Confiscatory policies are now explicit. To the rest of the world — particularly those who have endured the left — such confiscatory calls are all too familiar. Far from new and novel, they are very old indeed — both chronologically, and in the sense of being worn out. They trace back to the 19thcentury and were tried repeatedly in the last century. Each time they were miserable failures — literally — leaving those subjected to them in misery. Far from being “progressive” — today’s trendy attempt at rebranding — they are actually regressive. These policies are throwbacks in time, just as they are throwaways philosophically, economically, and politically. America has not known this in the sense of living it. Knowing it intellectually, that it actually occurred elsewhere, is not the same. To America’s collective mind, it has remained a foreign affliction — like leprosy or the plague — that does not, cannot, actually occur here. America’s only real encounter has been the momentary quadrennial contact with some crank running for president as a communist or socialist. At best, such candidates pick up a comparative handful of votes and curiosity. They are the crazy aunt who mercifully shows up only for major family gatherings. Only this time, she has brought friends. We have emotionally felt that socialism and its wealth confiscation could not happen here. It can, of course. These policies now being so candidly bandied about are exactly what it would look like. And these proposals are just the beginning of what the left will do, if given the chance. We just can’t kick the habit. Or the media can’t, which comes to the same thing, given the media’s habitual deference to its customers — you and me and Neighbor Jones. We’d rather hear about Donald Trump than about the specific problem he believes himself, on particular occasions, to be addressing. And so today’s big story on the Mexican border mess is all about DJT’s “purge of the nation’s immigration and security leadership,” to quote the New York Times. The story is a story. But it is not the story: the story, that is, of a mass migration that existing governmental procedures are too weak to inhibit. Thus, what do we do? How do we preserve America’s reputation as a simultaneously welcoming and politically stable country? Is Trump advancing the cause or not when he shows Kirstjen Nielsen the door — none too genteelly, we may assume — as secretary of Homeland Security and proceeds from there to overhaul the top ranks of the department? The answer likely depends on your opinion of Trump — as do all judgments to which we are dolefully invited these days. Either the chief magistrate is a low-rent swine, or he’s a faithful laborer against the “deep state.” Such are the choices with which political discourse, online or at the microphone, usually leaves us. Left undusted-off are the underlying questions: What’s the problem? What needs doing about it? You don’t get by for long without posing, and attempting to answer, those questions. I suspect most of us would not recognize Ms. Nielsen if she were ahead of us in the Kroger checkout line. I suspect most of us, without much labor, could imagine the implications of turning the Southwestern United States into a destination for every Honduran, Guatemalan, or Salvadoran with a painful story to tell about life back home. This matter is a hard one — painfully hard. The United States, pace the president’s assertions and the absurdity of his threats to “close” the U.S.-Mexico border (talk about unbelievable promises and undoable tasks! ), has ever welcomed refugees and always will — however, on its own terms, not the terms of those who’ve decided to live in the American house, never mind what the landlord says. I have been on church mission trips to Honduras. The Hondurans are, as Texans say, good folks. But is opening wide the gates to them, and to others from the region, the answer to their hardships? This does not compute. Corrupt government and the disappearance of social morale — leading to poverty, economic sloth and gang-led crime — have pointed many to the conclusion that flight is the only answer. The United States should act all the more sympathetically here for having failed, first, to recognize an obvious interest in the welfare of neighboring nations and, second, to create aid programs that enhance democratic capitalism and personal safety. However, from America’s blindness to patent needs you can’t jump to some fanciful American duty to make up for it all through general overhaul of its laws and policies governing refugees. The political instinct so to do is the same that stokes ever-sillier, ever-more-fervent talk of financial “reparations” to the descendants of African slaves. No nation does everything right. No nation can, given the ongoing defects of human nature. Anyway, it’s too late for replanting the Garden of Eden. Establish firm control of the situation. Enlist conservatives and liberals alike, as many as can be induced into such an unsavory alliance, to fashion for Central America an aid program that actually aids in addressing the afflictions of crime, subpar economic development and venal government. Well, it beats chewing the rug over Trump any old day of the week, doesn’t it?